Fred & Jo Anne are true partners in their venture of carving, Fred carves and Jo Anne paints. 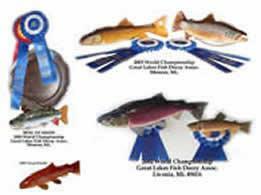 They do specie level of trout as well as bears and other carving items. Their decoys are of the highest quality seen. Made in Benzonia, Michigan by chainsaw carver and decoy maker Fred Campbell. Fred tests all of his decoys to make sure they are weighted, balanced and swim in a circle. 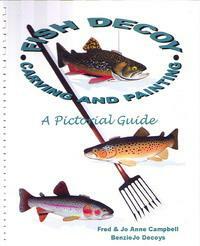 The decoys are then painted by his wife, Jo Anne. They are all hand painted, including the eyes. After they are painted, a waterproof finish is applied. 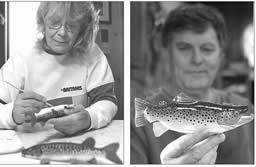 Fred carves 80 different species of trout and salmon, both service working decoys and decorative working decoys. The size of the decoys range from 6 inches to 13 inches. 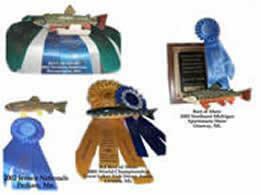 Benziejo Decoys has received several awards, including the GLFDA 2001 World Championship Competition, the 2001 & 2002 Jensen National Fish Decoy Contest and the 2001 Northeast Michigan Sports Show Decoy Competition. To purchase their book contact them directly. Read the Traverse City Record – Eagle – April 12, 2004 issue. In 2008 BenzieJo Decoys carved this decoy and sold it on eBay. All proceeds were donated to the Wounded Warriors Project. Yellowfin Cutthroat (Extinct) – 8 1/4″ long nose to tail fin. Fins are made of metal and the tail is carved from basswood. This is a fantastic bass dressed up as the good ole Red White & Blue – our flag. The quality extends past the wonderful paint job to the quality of the carving. When I saw this fish on Fred & Jo Anne Campbell’s website – I knew that I just had to have it. Jo Anne added the following on the bottom of the Fish. “Give me Liberty or Give me Death” The Fish is 11″ long and made from Basswood and belly weighted. This is a Sockeye Salmon Spawning Male made in 05/05 by Fred & Jo Anne Campbell. Fred carved it and Jo Anne paints. Highly detailed workmanship and is of specie grade. 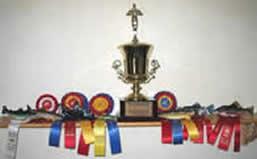 Each decoy that I receive from Fred & Jo Anne seems always to be given with a touch of love. Decoy is weighted and is 8 1/4″ nose to tail fin. Fins are of metal and the tail is carved. Made from Basswood.